Want an easy recipe to add to the weekend lunch menu? This is it! 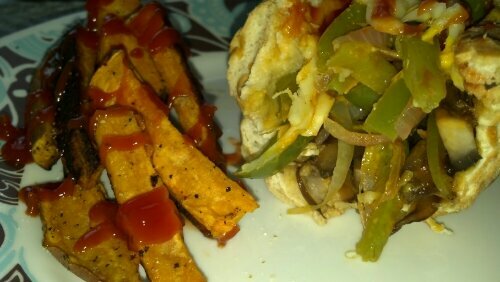 Instead of using a veggie meat, I opted for portobello mushroom slices. The texture of portobellos are quite dense and meaty anyway, so they made for the perfect substitute for thin sliced beef in an authentic Philly Cheese Steak Sandwich. Slice veggies accordingly. Heat oil in medium skillet to medium/high heat. Add garlic, cook until the “raw” smell goes away (about 5 minutes). Add rest of veggies, season with paprika, mix to coat, then sautee for 10 minutes. Reduce heat to medium/medium-low and cook well until veggies are soft. Fill with veggies, top with Daiya shreds if you want, toast in the oven or toaster oven until melted and bread is slightly toasted. Makes about 2-3 sandwiches. Serve with baked sweet potato fries.